Vanguard investor class shares on their way out? I noticed in the last semi-annual report for Vanguard small cap index funds, capital share transactions for investor class shares are negative while ETF and admiral share transactions were significantly positive. Given the higher expense ratios for investor shares versus admiral and ETF classes and shrinking number of shares in investor class, doesn't this represent something of a potential death spiral for investor class shares? Expenses will be spread over fewer and fewer shares and shareholders assuming this pattern of net share redemptions persists. Given the move at Vanguard to brokerage accounts and significantly lower costs for purchasing ETF's at other brokerages versus mutual fund shares, I'm not sure what the current and future case would be for owning investor class shares at all, either at Vanguard or elsewhere. Small Cap Value example below highlighted, but it was the same story for small cap and small cap growth. 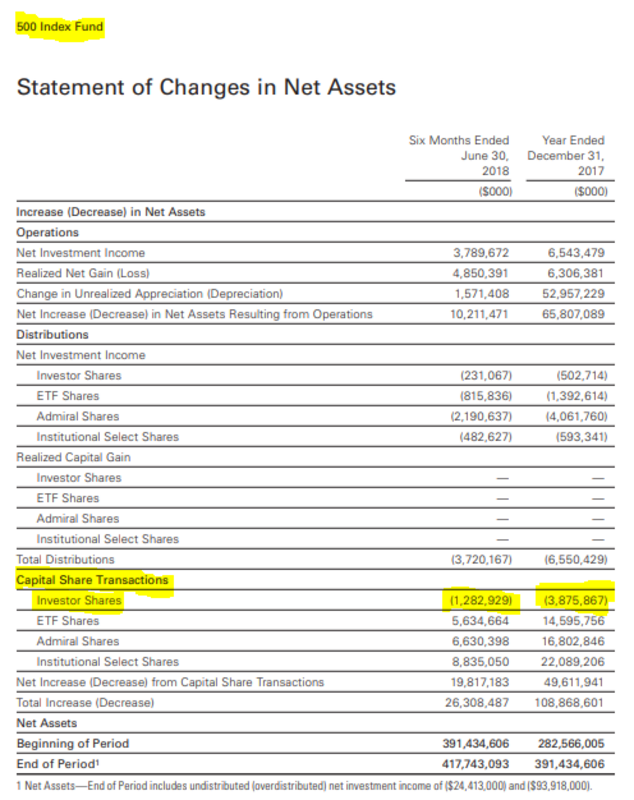 Re: Vanguard investor class shares on their way out? Could much of the outflows could be due to the fact that SCV is drastically underperforming the S&P lately? There wasn't any outflow for ETF and admiral class shares (quite the opposite in fact) and the same pattern held for small cap and small cap growth index funds. Would be nice if Vanguard drops/merges the investor/admiral/institutional share class stuff like Fidelity is doing with some of its mutual funds. Look at 12/31. Inflows are slowing across all share classes. Let's look at the latest Vanguard S&P 500 index fund report so we don't get bogged down on small cap. Last edited by MnD on Mon Nov 12, 2018 6:53 pm, edited 1 time in total. I'd guess that young investors are using ETFs, some people are converting their investor shares to ETFs, and others are bringing their balances above $10K. Converting to another share class would drop investor share assets. I'm not sure how this would harm existing investor share holders? Vanguard is not going to liquidate the accounts. They can't convert mutual fund accounts to brokerage accounts without permission. If anything they will eventually just make everything Admiral shares. They can also easily change how they allocate expenses between share classes. I wonder if Vanguard’s “upgrade” to brokerage accounts is making some people who would otherwise have stayed in investor class funds take a look at ETF funds after the transition. Last edited by bjr89 on Tue Nov 13, 2018 6:28 pm, edited 1 time in total. the institutional shares you listed for small cap value as of 6/30/18 had net outflows, but I don't see them ending institutional shares, do you? In most funds (index or otherwise), the investor class has been shrinking for a number of years. Whether that means the investor class disappears altogether, I find hard to judge. In most funds, the class still has billions of dollars. As recently as the late 1990’s, this was a major size for a whole mutual fund. With most small investors getting service via the Web, I'm not sure there is much of an expense "death spiral." The expense ratio hasn't been going up for the Investor Class for the funds I'm familiar with (perhaps just not down as much). It is also true that the minimum investment for most Vanguard funds is still the same ($3000) as it was when I started investing with Vanguard in the early 1990’s. While that would not be close to $10,000 adjusted for inflation now, the inflation-adjusted figure would be rather higher. Presumably Vanguard will decide when the investor class for one or more funds gets low enough to have the class go extinct and then we will know. It is the flip side of the other thread on when a fund (World Stock?) will get Admiral shares. Having multiple share classes is so old fashioned and lame. In 2018, it's not a good look to give deals to rich people. I don't think they are giving deals to rich people. They operate at cost. Service such as sending out statements cost money. However, an alternative is to convert everybody to admiral shares but charge a fixed amount for serving the account unless the customer select electronic communication on everything. Some mutual fund companies use this setup for small accounts. Still, the Investor Class has a shade less than $27 billion in assets (as of June 30) and the total in the class has been roughly the same since the end of 2013 (and I'll bet there has been mostly capital share outflows since that time). That's a lot of money in the class. In addition, the expense ratio has gone down from 0.17% to 0.14% since 2013. Hard to see a problem with expenses for this class in this fund. When you get to 10k, don't upgrade to admiral shares so you don't take advantage of the oh so unfair "deal." (the "deal," by the way, is merely a reflection of the lower costs incurred by Vanguard in managing a larger account). Last edited by bjr89 on Tue Nov 13, 2018 6:27 pm, edited 2 times in total. When I said old fashioned, I was referring exactly to your argument. Old fashioned may be but it is not lame. (BTW, I had investor shares for many years and only recently got converted to admiral shares.) I do not view multiple classes as giving deals to rich people. For those who want to get rid of investor class, it's with calculating how much expense ratios on other shares have to go up to facilitate that. Hint: It's more than you might guess. First of all, it's smart to not presume too much about people you know nothing about. I don't even use VG's mutual funds. Just their ETFs. I own and operate an investment management firm, and I don't use any kind of tiered fee structure. I think it's lame to do that, sorry. Also, certain roboadvisors charge nothing until you hit a specified balance. So, just so I understand what "lame" means with respect to charging your clients fees. Vanguard is lame for charging people with under 10k 0.14% ER for investor shares TSM, whereas you're not lame for charging all of your customers more than 0.14% plus the underlying fund fees. Got it. Keep up the unlame untiered investment management. The median income for US households in 2017 was $61,372. Half of households had income less than the median. The $3,000 minimum for investor shares may be difficult for those families. When I began investing many no load funds had a $1,000 minimum; Vanguard had a $3,000 minimum for funds other than the STAR fund which had a $1,000 minimum; Fidelity had a $2,500 minimum. My first investment was with Janus because of the $1,000 minimum. Vanguard may chose to market to investors who have incomes well above the median. Fortunately, I have prospered since the early days of my investment experience. Last edited by bjr89 on Tue Nov 13, 2018 6:26 pm, edited 1 time in total. So, just so I understand what "lame" means with respect to charging your clients fees. Vanguard is lame for charging people with under 10k 0.14% ER for investor share TSM, whereas you're not lame for charging all of your customers more than 0.14% plus the underlying fund fees. Got it. Keep up the unlame investment management. I use Vanguard ETFs personally, and to a lesser extent for business for certain exposures. I run a multi strat fund, and I charge 2 and 20. My clients are sophisticated and understand what they're paying for. I really was just trying to stand up for the small investor. Take it easy. I see. So the fact that the small investor doesn't even have access to your fund is fine but Vanguard charging an additional $10 per year (on TSM) to cover its costs isn't fine. I don't see what the difference in sophistication has to do with anything. And while we're on fairness of fees, the sophistication of your clients doesn't make the 2 and 20 you charge any more fair. Either your fund is good value or it isn't. I'd guess the latter (like all hedge funds, nothing against yours in particular, of course). An extra 10 basis points on an amount below the $10k minimum for Admiral index shares adds up at most to less than $10/year. If you plan to keep and add to your investments at Vanguard for the long term, you're much better off paying the higher ER on a small amount than you would be if everything got merged into one share class that had a slightly higher ER than current Admiral shares. Last edited by bjr89 on Tue Nov 13, 2018 6:25 pm, edited 1 time in total. I remember seeing an inverview that Christine Benz of Morningstar did with Tim Buckley recently. He was asked a question about share classes and mentioned that they re-evaluate the pricing and share classes on a yearly basis. I would expect to see some movement on S&P500 funds and TSMIs because of competitive pressure. My guess is that the minimums will drop (maybe $1,000 and $5,000). Its possible that ERs will drop in response to Fidelity too, but given the at cost model this seems less likely to me. Can someone explain how any cost scaling argument applies to traditional mutual funds and not ETFs? Why would a $150 ETF get a .04 ER when you are nowhere close to investor class minimums on MFs? Honest question, not trying to be snarky. I don't see the merging of shares classes resulting in a fee increase given what happened with Fidelity and VGs own pricing of its ETFs. Also, VG already waives Admiral minimums in certain 401k and HSA situations. I could see the minimums change if Fidelity is able to make a significant dent in the fund flows numbers, and I all but guarantee VG won't raise fees in that scenario. My investors are actually quite happy thus far. But it's risky. There's leverage. There's a chance they could lose their investment, and I am quite open about that. I don't feel comfortable taking money from small investors. Certain more speculative ventures, like leveraged absolute return funds, are really only appropriate for the exorbitantly wealthy. This is why there are rules surrounding performance fees in the first place. Now, onward with the righteous crusade to nickel and dime the less financially fortunate. If you thought you were actually providing value, you'd have no problem having small investors invest. You clearly don't and the fact that your clients are sophisticated or can tolerate the losses is no excuse. In any case, Vanguard is clearly "open" about its expense ratios so I don't see why that isn't the end of it. Enjoy your crusade to bilk the financially fortunate. Last edited by bjr89 on Tue Nov 13, 2018 6:52 pm, edited 1 time in total. Perhaps this is mostly shares being converted from investor class to admiral or ETF class. Several of the US Government Bond Funds (non-index: Short-Term Treasury, Short-Term Federal, Intermediate Treasury) now have Investor Class asset bases down to the $600-800 million range. Clearly Vanguard currently feels that these are large enough to continue Investor shares. For the 500 index, there's $28 bil in investor, $265 bil Admiral, and $105 bil in ETF. My calculation is that the combined ER would be 0.047%, if combined. So an increase of 0.007%, that's less than I would've guessed. While there may be differences in cost to administer small accounts, the small admiral accounts appear to be getting just as much of a subsidy as small investor accounts. At $10K and 0.04%, that's $4 per year for the smallest admiral, at $3K and 0.14% it's $4.20 for smallest investor. IMO, the Admiral/Investor classes make more sense in the managed funds, where there is a much more substantial difference in minimums. ETFs are a completely different beast than a Mutual Fund. Vanguard does not have to do record keeping on individual accounts for each ETF share. They simply issue the shares to the stock exchange and the brokerage house holding the account incurs all the costs of record keeping for that share. Thus in theory an ETF should represent the something approximating the core cost of operating the fund from an investing and regulatory perspective. Interestingly, Fidelity has taken a very different tack due to the fact that they have seen net outflows for nearly 8 years now. They are without a doubt subsidizing their retail mutual fund accounts costs with maintaining higher fees in their 401(k) business, active stock and bond funds, high ER money markets, etc.... In other words, some folks are paying the bills to allow Fidelity to buy low balance customer with a free toaster. Fidelity is clearly doing this to maintain market share and AUM levels, but since they make no pretense to apportion costs to those customer who incur it, they are free to mark-up business they feel is safe or low-risk and subsidize customer and $ acquisition. How long they can do this is really the big question for the industry. Vanguard may feel the pinch before Fidelity or Fidelity may start to see erosion in their bottom line due to overwhelming demand for a "free" product. I believe that the ETF transition is the final step of this process and I think Vanguard sees it too and plans to win in the ETF space as lowest cost provider almost by definition wins there. No one will survive subsidizing ETF ERs for long as they have no way to make it up on other places. Vanguard's free ETF trading is a subtle but powerful move in that direction. Fidelity's worst nightmare would be for their customers to get acclimated to ETFs and brokerage accounts and buy iShares and Vanguard ETFs all day long while holding a nice portfolio of core index funds in Fidelity's Zero funds. They'd go broke in a slow painful way unless they can actively entice their customers into buying some of that high margin stuff they haven't marked down. The reason Fidelity is not going to feel that pinch immediately is that only about 1% of the investors are true BogleHeads who focus like a laser on expenses. They'll be able to entice enough folks to leave $20K or more a year in a MM or active fund that has an ER 4X of Vanguards equivalent. That'll keep the revenue flowing. But then the brokerage charges nothing for this service, either. Vanguard brokerage is free with no minimum balance, correct? There is no commission on buying/selling of Vanguard ETFs at Vanguard's brokerage and the ER of these ETFs is the same as Admiral shares. I'm not sure why anyone with less than $10K would use investor class shares instead of the equivalent but cheaper ETF in the first place. That is why Vanguard's free ETF move is so subversive. They believe they can run their brokerage business just on the spreads in the ETF trades (I believe that is their strategy, haven't read it explicitly being stated by a Vanguard representative) and not charge transaction fees. Most other brokerage are still looking to charge for trades at some level. Vanguard is putting pressure on that revenue source and hastening its demise. BTW, there is another source of revenue that Vanguard is killing with ETFs, they are NOT paying or receiving the listing fees that TD, Schwab, etc. share for putting ETF's on their preferred lists. This is behind the scenes of customers, but puts the brokerages in a world of hurt (look up Kitces article about this... I don't have it handy.) It is why Vanguard funds have been disappearing from the no commission lists at the other brokerages. All this is to say that it looks to me like ETFs (regardless of Jack Bogle's distaste for them) will be the low cost end-state of the industry. Vanguard is putting pressure on Active Fund Management (as it has for decades with great success. Vanguard is taking away ETF Brokerage Commissions (and back-office revenue sharing) for everyone! Vanguard is one of the leaders in lowering the cost of Financial Advice. Vanguard has set the low bar for ER on ETFs using their at-cost model. These are really good times to be a passive investor. There is a circular firing squad removing costs from the system. John Bogle has stated several times that he thinks the end state of the entire industry is that all companies will end as Mutual Structured at-cost entities similar to Vanguard. It seems improbable until you look at the relentless cost cutting as seen above. The only reason it wouldn't happen is regulatory protections of some sort for the existing institutions. In fact, some would argue the demise of the recent Fiduciary Rule is exactly for that reason. First, let me confirm and extend retiringwhen's point - the cost structure of running a ETF is much lower for the sponsor. Custodial fees is just one aspect. Elimination of the trading desk, not having to handle daily cash flows at the client level, lower daily reporting requirements, etc. To your point Jeffyscott, I don't have a complete answer. I can say that running ETFs through the standard stock market / DTC channel is less expensive than having to maintain a independent networking and wholesale channel for each and every fund family / broker. I don’t see any problem with share class distinctions. Vanguard isn’t price gouging anyone. To avoid the annoyance of ETFs, while building balance to reach the Admiral level? That is why Vanguard's free ETF move is so subversive. They believe they can run their brokerage business just on the spreads in the ETF trades (I believe that is their strategy, haven't read it explicitly being stated by a Vanguard representative) and not charge transaction fees. I run a multi strat fund, and I charge 2 and 20. You are not the first of your ilk to criticize Vanguard. This. And the extra cost of investor shares is de minimus (and you could lose a lot more mishandling ETFs). I understand some other brokerages do support regular automatic purchases, so that may not be a long-term issue. It has been discussed on the forum and other places by folks in the know. They believe it is possible to cover the costs with just the spread. It’s cute that you think people qualify for institutional class individually. And one hardly needs to be rich to buy an ETF, they receive the low ER starting at the price of a single share (~$140 in the case of VTI Vanguard Total Stock). I don't think it's that simple, these cut points and fees are somewhat arbitrary. The small balance fee is $20 waived with paperless or a $10K balance. Therefore, the assumption would be it costs Vanguard $20 per year to send paper. An investor with only index funds in Admiral shares or ETFs would have to have something like $20,000-$40,000 (based on 0.05-0.1% ER) before their total expenses would even reach $20 to cover just the mailing costs. The idea that every individual investor is paying exactly the costs ascribed only to themselves is false. The idea that anyone ever had that exact idea is false. Is there really much more expense to Vanguard from "investor shares" than there are from "admiral shares"? It seems like the difference is mainly one of bookkeeping, and there can't be much added expense there. I would think the biggest expense with a lower-balance account (i.e., not enough in any position to qualify for admiral shares) would be the initial set-up cost of the account ... but that would be offset by the long-term growth potential as the person adds money to their account.